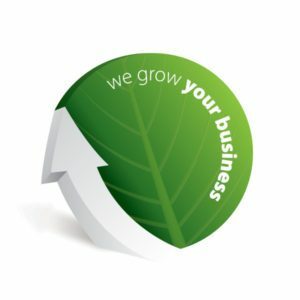 We Grow Your Business Online! Every business owner wants more customers, right? 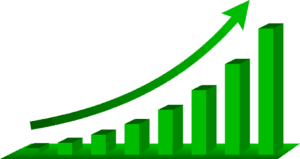 Can we acknowledge that the best way to reach more customers nowadays is through the internet? OK…then let’s talk about HOW !!! As a business owner, you have probably done a search for your own website. I do this very thing myself to find out where I am ranking for specific “keywords”. Using my own site as an example I would type “Oshawa SEO”, or possibly even “Oshawa search engine optimization”. “Oshawa SEO expert” is another favorite. We could say ” affordable seo services Toronto” but that would be for another page. As an alternative, I might type in “SEO company”, “SEO firm” or “SEO agency”. Here is a sample of what we call ” the blanketing technique. No point in having just one web property on page one when you can have several. 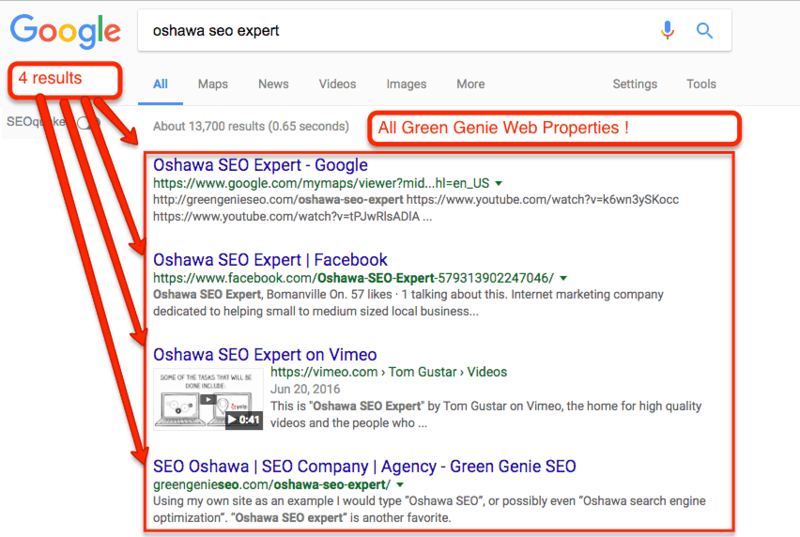 Depending on whether I use a location such as Oshawa attached to my search query (“Oshawa SEO company”) I will end up with a different set of results. As a business owner looking for his or her own search results, you may want to keep this in mind as you scour the Internet to find yourself. Another tip to consider is this. Google, for example, serves up search information based upon your IP address. This is difficult to circumnavigate because your IP address is what it is. on local relevancy due to the fact that that is where most of their business is coming from. 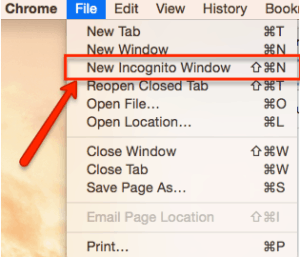 However, you will want to do this search using Incognito Mode if you are searching using Google Chrome, private browsing if you are using Safari or any other type of, what we call, “logged out search”. If you fail to do so and use the standard mode of search browser, the data that is returned to you will be flawed. Buy flawed I mean that it won’t be what other people see when they search, and of course, this is what we want. You might ask yourself why I am giving an educational tutorial to potential customers that are visiting my site? My reasoning for this is simple. Search engine optimization is a bit of a mysterious entity. If you have come to the point as a business owner, that you were actively looking for someone to perform this SEO task, you probably know more than the majority of people in the general population, but certainly not enough to be clear about what it is that you’re potentially paying for. I like my clients to be informed enough to realize the value that we deliver as SEO Practitioners. It would be nearly impossible for this to take place if you ,as a business owner, cannot simply verify his or her own search results. How would you know if the work being performed was effective otherwise? I could talk all day about how I am the best SEO expert in the district but everybody says that, don’t they? If you haven’t done so up until now, take the time to listen to the video at the top of the site. I think you will be better informed as a result. Beyond that, I encourage you to read the information further down the site in the section entitled “ some straight talk about search engine optimization”. Beyond that take the time to fill out the “discovery form”. Think of this discovery form is filling out a medical questionnaire for your doctor. You have a dis-functioning website and you are looking for a cure for this dysfunction. The only way that it is possible is for you to give us as much information about the patient has possible. Please take the time to fill it out thoroughly. The access to the discovery form it is straightforward. Simply look for the green buttons on either side of the video at the top of this page or the one near the very bottom of the page that says “ Discovery form “. We also partner with the top web design company in Oshawa to be sure you get a quality web design project and a properly optimized site right from the ground up. [icon type=”thumbs-up”]As previously stated, SEO is not the answer for every business…..However. Honestly , does any business person really care about the technical definition of, or the strategies needed to implement an effective Search Engine Optimization campaign? If you do, then that’s great, we can talk more about that. For now, let’s talk about what it can achieve for your business! WHAT CAN SEO DO FOR ME? SEO, over a relatively short period of time, can help your website get to page one of Google. 90% of the clicks to websites come from visitors to Page 1 ! WHAT IF I AM ALREADY ON PAGE 1? That’s great. But for what keyword(s)? You could very well be ranking on page 1 for your name but that is a given. You need to rank for the more competitive keywords because they are the words and phrases that people are, by nature, typing into Google to find a product or service such as yours. Keywords are like individual phonebooks. In the tradition phone book you had a ranking based on your name. With a company name like “AAAAA Abattoir ” you would likely be the first listing on page 1. ” Zekes Slaughter-house” would be much harder to find! Keywords have far less limitations. Let’s say you were a hypnotherapist. People may type in “hypnotherapist” to seek you out. The results for that search would constitute a virtual phonebook that Google would assemble for the searcher. But “hypnotherapist in Phoenix” or “hypnotist” or “hypnotherapy for smoking” would create their own individual “Virtual Phonebook” pages with very different results for those doing the search! OK SO HOW DOES THIS CONVERT TO $$$? HOW MANY KEYWORDS SHOULD I RANK FOR? That depends on your budget, your type of business, your personal objectives and many other factors. IS SEO MY ONLY OPTION TO SHOW UP ON PAGE 1? No , you could pay for ads that may or may not put you on page one all of the time. It depends on the competition for keywords again. If your competitors are paying a higher price per click you fall lower in the rotation on page 1. The costs can get very high in competitive markets. HOW HIGH CAN ADWORDS COSTS GET? Depends on how high of a budget you have. I know a plumbing company that spends $70,000 per month! It’s possible that a strong SEO campaign could achieve similar results for a fraction of the cost with more sustainable results! 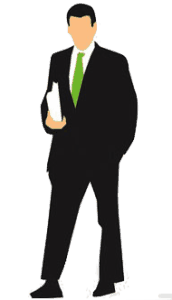 Share the post "SEO Company Oshawa"